We love beans in any way shape or form around here. They are a frugal staple, healthy and very versatile. 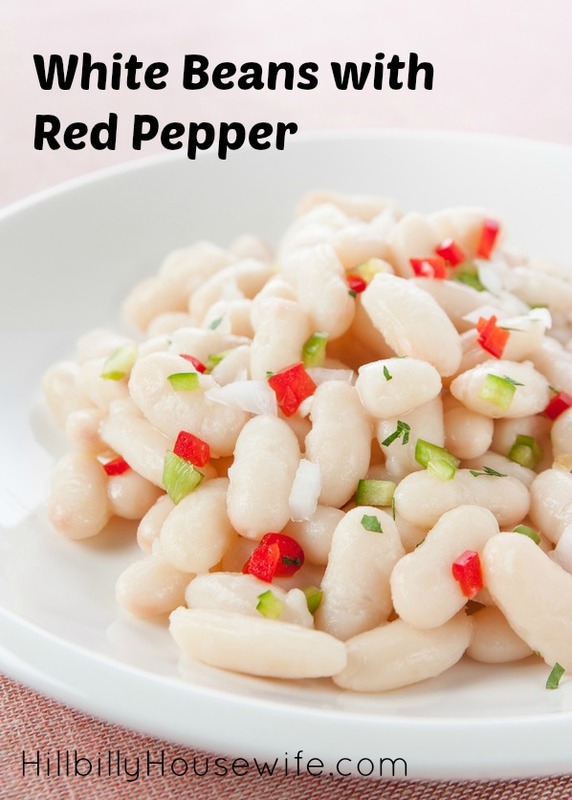 When you’re ready to step it up and make some “sophisticated” bean dishes, give these white beans with red peppers and pesto a try. The recipe is from the Thrifty bean cookbook and is the most elaborate dish in the cookbook. Don’t let the long ingredient list turn you off from trying this though. It’s delicious. You can also omit the pesto, or use your favorite pesto in a jar. Start by preparing the pesto: add the garlic, pine nuts, olive oil, water, salt, pepper, basil and Parmesan cheese to a food processor and process until smooth. Now prepare the beans: first, sort and wash them. Add the beans and 4 cups of water to a 6 quart pressure cooker. Cover and make sure lid is tightly closed and over high heat, bring to a high pressure. Reduce the heat to medium (or a level that will keep the high pressure) and cook for 3 minutes. Place the pressure cooker under cold running water; remove lid and drain the beans. Put the beans back in the cooker and add 6 cups of water, olive oil, sage, garlic and onion. Put lid on and make sure it’s securely in place; bring to high pressure over high heat. Reduce the heat to medium (or a level that will keep the high pressure) and cook for 12 minutes. Put the cooker under cold running water. Now remove the lid off the pressure cooker and let the bean mixture stand for 10 minutes. Drain the mixture (beans) into a colander that is sitting over a bowl. Reserve 1 cup of the liquid. Place the beans back into the pressure cooker; add the 1 cup reserved liquid. Now add the vinegar, bell peppers, salt and pepper. Stir well to mix everything together. Top the beans with the pesto sauce.